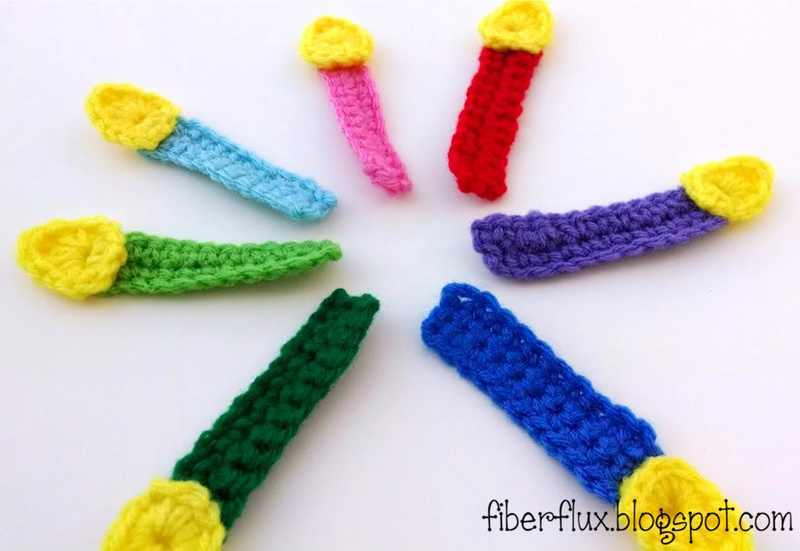 Fiber Flux: Free Crochet Pattern...Birthday Candle Applique! 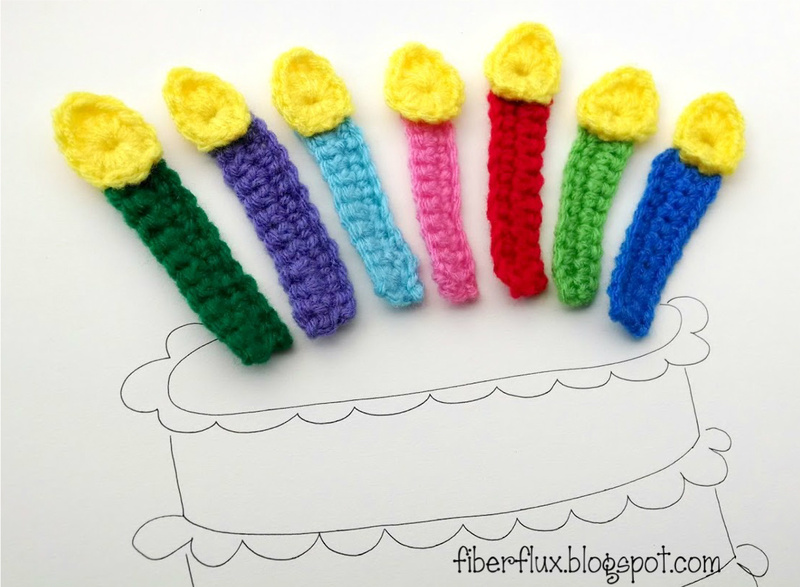 Free Crochet Pattern...Birthday Candle Applique! For all of your birthday festivities, here are some cute appliques that are festive and bright! Use them for a birthday garland, or sew them to a t-shirt...one for each year in their favorite colors. They use just a small amount of yarn and work up super fast! Into the center of the ring, work 4 sc, a hdc, a dc, a tr, a dc, a hdc, and 4 sc. Join to close with a slip stitch and fasten off. Row 1: In the second ch from the hook, work a sc, then a sc in each ch across. Row 2: Ch 1 and turn. Work a sc into the first st and in each st across. Fasten off. Weave in all ends except one (either on the flame or candle base). Because the appliques are small, you may have to shape everything up a little with your hands. Thread a tapestry needle and use the last end to sew flame onto candle base as shown with the flame slightly overlapping a little over the candle base. Weave in any ends that remain. Note: If candles are curling bit, you can block them. This will straighten everything out. If using acrylic or cotton, you can quickly steam block them. My friend Tamara over at the Moogly blog has a really helpful video tutorial on steam blocking with an iron. If you're using natural fibers for your project, wet blocking will help too, check out this photo tutorial.